Duration: 8 Nights / 9 Days Tour. 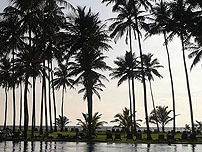 We will welcome you at the Colombo airport and will transport you in an A/C vehicle to Negombo hotel. Hunasgiriya mountain range provides you with cool green area with spectacular view and this will be your first stop over. A waterfall is running throughout the area of tea and spice plantations and this area is very calm. The waterfall runs as a stream and joins a small lake and your hotel is located next to this lake. This is one of the pleasant places to enjoy your day out with your partner. From this area you can view fascinating sunset, mornings surrounded with mist and is relatively cool, where temperatures ranges between 17- 25C by day, and around 10C in the night. 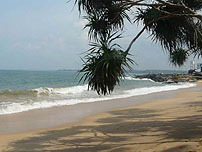 This place is called as paradise of Sri Lanka for honeymoon couples to spend their holidays. Kandy, is the mountain city, surrounded by the Mahweli River, Sri Lanka's longest one. 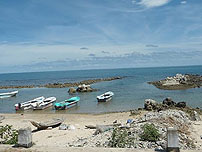 This city served as the capital of the Island's last independent Kingdom. This is a calm cool pace to enjoy your intimate moments. Also you can explore traditional art and crafts in the city. Visit the popular Buddhist Temple Dalada Maligawa while in Kandy to view the marvel of this magnificent temple. Nuwara Eliya is popularly known as little England, due to its town architure and climatic conditions it provides except the snow. It consists of buildings ranging in style from Georgian era and designing from Queen Anne. Parks, trout streams, 18 holes of golf course are some of its best features. The Anglican Church remains with a lych-gate, and the hill club, with its hunting prints, stuffed fish and polished Oak and many other things to enjoy over there. Ella is blessed with some of the most beautiful views, you could find in this nation. Tourists used to stay in this small town, which is used as a base for plenty of trekking expeditions to the surrounding countryside. Mirissa - one of the best beach in Sri Lanka which is close to the most Southern tip of the nation and in fact the Indian sub-continent as well. This is a best place to stay under the beach umbrella avoiding the direct sun in a relaxed mood with your favorite drink or go on with your favorite water sport with your partner in the blue ocean. We will take you back to Negombo on our last leg of journey. From here we will drive you to the Colombo airport in time to catch your flight back to your home or to your next destination.